We’d love your help. 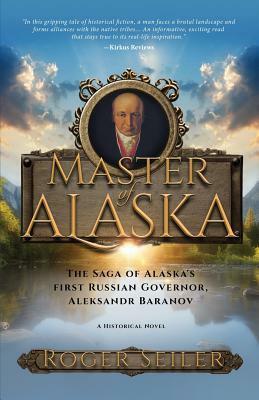 Let us know what’s wrong with this preview of Master of Alaska by Roger Seiler. To ask other readers questions about Master of Alaska, please sign up. This was as a 3.5 star book with some fantastic history naturally weaved throughout. The early information I had about for Alaska was very sketchy and it was fascinating to get an in depth timeline without reading simple dry facts. I liked that the arc was told through the experiences and challenges of Baranov although some times the events jumped from one to another fairly quickly. One thing that is for sure is that life in Alaska wasn’t for everyone! I have always wanted to visit and this make This was as a 3.5 star book with some fantastic history naturally weaved throughout. The early information I had about for Alaska was very sketchy and it was fascinating to get an in depth timeline without reading simple dry facts. I liked that the arc was told through the experiences and challenges of Baranov although some times the events jumped from one to another fairly quickly. One thing that is for sure is that life in Alaska wasn’t for everyone! I have always wanted to visit and this makes me even more determined to make it up there. The first Govenor of Alaska!! Wow! Baranov was a tough old bird!! The wilds of Alaska comes out in droves in this read. Baranova is shipwrecked, starved, saved, starved again, but he comes out on top. What a read. This is a very well researched historical account of the beginning of Alaska. I am amazed at the intricacies that weave throughout this novel. The politics in Russia which lead to Baranov setting sail for parts unknown. Also, the politics of the Aleut natives, or maybe I should say, th The first Govenor of Alaska!! Wow! Baranov was a tough old bird!! The wilds of Alaska comes out in droves in this read. Baranova is shipwrecked, starved, saved, starved again, but he comes out on top. What a read. This is a very well researched historical account of the beginning of Alaska. I am amazed at the intricacies that weave throughout this novel. The politics in Russia which lead to Baranov setting sail for parts unknown. Also, the politics of the Aleut natives, or maybe I should say, the customs of the natives, really create a unique tale for history buffs. I love all books set in Alaska. Why? I really could not tell you. This read was enjoyable to me because of the setting and the history woven within. That being said, it is a little long winded and wordy in places. But, enjoyable nonetheless! Incredible story so well written, that you forget it is based on REAL history. Author writes dialogue so compelling that you feel you are there. This author has a beautiful way of constructing gripping stories, reveling in the scenes, sharing the pine-scented air, ducking arrows, and creating heart-stopping action with his characters. The book follows the story of Aleksandr Andreievich Baranov, a merchant from Russia who is sent by Catherine the Great (time of President George Washington) to pro Incredible story so well written, that you forget it is based on REAL history. Author writes dialogue so compelling that you feel you are there. This author has a beautiful way of constructing gripping stories, reveling in the scenes, sharing the pine-scented air, ducking arrows, and creating heart-stopping action with his characters. Great book I’ve learned about the Russians in Alaska when Washington was our president and their relationship with the Native Americans. This book has made want to learn more about the explorers of Alaska and the Pacific NW. A must read for those who are truly interested in the history of our country.